High-Speed Video Slot Token From Sloto'Cash Casino! Are you ready for full-thrust speed? Accelerate your winnings playing at the high-speed video slot Green Light available at Sloto'Cash Casino! 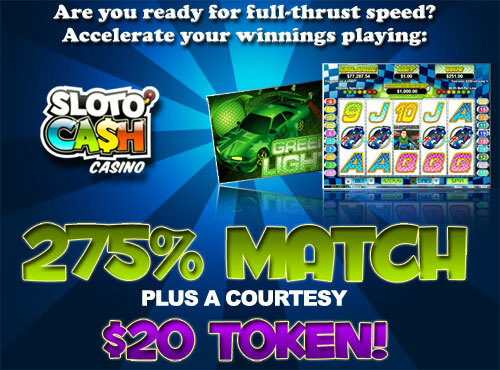 There is a 275% Match with code 275FULLSPEED on your initial deposit only at SlotoCash Up to $825! There is a 32x wagering requirement and there is no max cashout! This bonus code expires March 29! Plus get a courtesy $20 token, no deposit required! Request this token upon completing the 275FULLSPEED coupon via Support live chat or email. About RTG's Green Light: Pick your car and buckle up because when the Green Light shines engines will roar and the smell of burning rubber will be in the air. Cross the finish line first and win the most green! Collect two scattered Green Lights and win a special payout. Collect three or more scattered Green Lights and you unlock the Racing Feature where you will win 5 to 25 Free Games. Come in 1st or 2nd in the first race and you'll qualify for a second race where you will win prizes of 2 to 100 times your triggering bet. Visit Sloto’Cash, where every day is a lucky day! US players are welcome too! Eyes Down For The Biggest Giveaway Of The Year!